BRH vs MLS, 53rd Match, Big Bash League 2018-19. BRH declared 13-men squad with one change Brendan Doggett returns to the squad replacing Sam Heazlett. Brendan Doggett is likely to replace Jack Prestwidge or Mark Kuhnemann in the playing XI. Mark Steketee can also get a chance. MLS have also one change Sandeep Lamichhane replaces Liam Plunkett in the squad. Chris Lynn (c), Max Bryant, Ben Cutting, Brendan Doggett, Josh Lalor, Brendon McCullum, James Peirson (wk), Mitchell Swepson, Alex Ross, M Kuhnemann, Jack Prestwidge, Matt Renshaw, M Steketee. 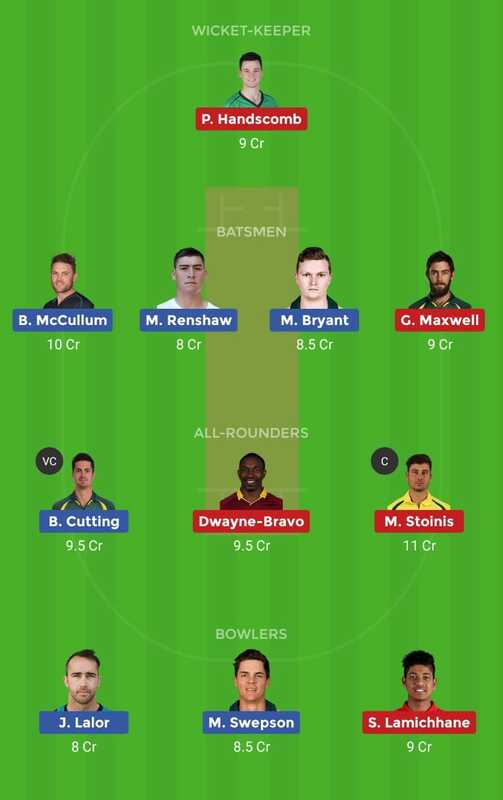 Ben Cutting, Max Bryant, Chris Lynn (c), Brendon McCullum, Matt Renshaw, Alex Ross, James Peirson (wk), Josh Lalor, B Doggett/J Prestwidge, Mitchell Swepson, M Kuhnemann/J Prestwidge. You can make your own team with the help of Video & Select your own C & VC.